that’s the slogan of axbo, a unique alarm clock that sebastian told me about, several months ago. several months ago (minus a few days), i went and ordered one. axbo is a sleep phase alarm clock – it monitors your sleep stages and determines the best time to wake you up within a 30 minute time frame. whenever one cycle of sleep stages is completed (takes about 90 minutes), there’s a short “nearly-awake” phase – this is when you turn around or pull that blanket up a little more. this is also the best moment to wake up, because you’re sort of already awake, just not aware of it. i often have trouble getting up in the morning, especially in winter. in the past few months, it’s been much easier. 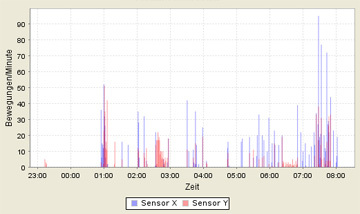 the supplied software even allows you to create graphs of your sleep activity. when i bought it, the cashier asked me what that was, and i explained it to her. me: it’s an alarm clock that determines the best time to wake you up. cashier: (doublechecking) how much does it cost? I have an aXbo, too. 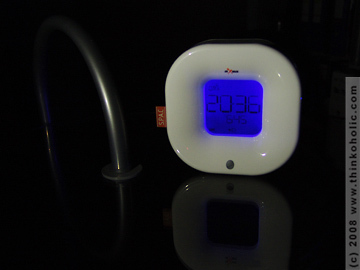 So I can understand why you spend 200 euros for an alarm clock ;-)… to feel like you have been woken up by yourself. Did you ever use the PowerNap function? i do use the powernap feature from time to time, it comes in handy when i have to stay focussed for very long periods. at the time, i’m using the chillout program a lot: it plays relaxing rainforest- or sea-noises which fade out as soon as you’re asleep.